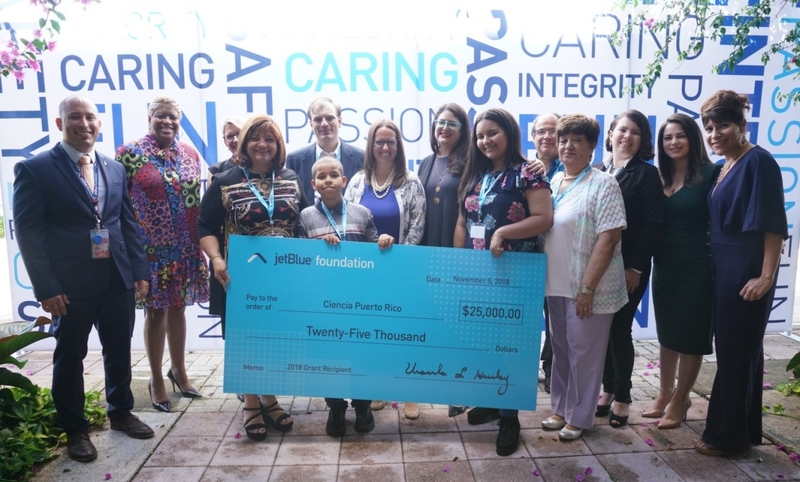 SAN JUAN, Puerto Rico, November 8, 2018 /3BL Media/ – JetBlue (NASDAQ:JBLU) today announced the JetBlue Foundation has awarded $135,000 in grants to science, technology, engineering and mathematics (STEM) education programs in Puerto Rico to aid in long-term post-hurricane recovery. Grants of varying amounts were provided to organizations that are investing in the island’s future and placing aviation and STEM top-of-mind as career choices for students. Earlier this spring, the JetBlue Foundation opened a granting application cycle to qualified programs and organizations working to fuel STEM learning. The Puerto Rico-specific grants are part of 100x35JetBlue, which is JetBlue’s ongoing initiative to help Puerto Rico recover from Hurricane Maria through 35 ways over 100 days and beyond, with the JetBlue now focusing on the long-term phase. JetBlue currently serves three destinations in Puerto Rico including its San Juan focus city where JetBlue is the largest carrier, as well as Aguadilla and Ponce. This year, JetBlue celebrated its 16th anniversary of service to Puerto Rico. Ciencia Puerto Rico’s mission is to democratize science and transform education in Puerto Rico by engaging and empowering a diverse, global community of scientists, students, educators and allies. Through its "Ciencia al Servicio de Puerto Rico" (Science in Service of Puerto Rico) program, the non-profit will leverage its large and committed network of more than 9,000 STEM professionals and educators to transform the way science is taught on the island. EcoExploratorio inspires people to explore, share and protect the natural environment through STEM. EcoExploratorio will develop the “In the Clouds” program to enhance Aviation Engineering and Technology, Aviation Weather Forecasting and Sustainable Development. “In the Clouds” will work with 25 girls ages 10 to 14, from economically disadvantaged and under-represented communities throughout San Juan to stimulate their interests in aviation and STEM. Inter American University of Puerto Rico (INTER), a previous JetBlue Foundation grant recipient, is the second largest university system in Puerto Rico. INTER Aguadilla focuses on the holistic formation of students through excellence at the undergraduate and graduate levels. At least 30 students per semester will learn the culture of science, and all academic areas will be strengthened with special attention to an interdisciplinary education and the integration of technology. The Aguadilla Campus will form the “Microbial Biodegradation of Jet Aviation Fuel” program as an opportunity to mentor the next generation of the Puerto Rican STEM workforce. INTER Bayamón produces competent professionals with a high-quality academic education that is dynamic, relevant, and responsive to the latest advances in STEM, aeronautics, business administration, and the arts. The “Give Wings to Their Dreams” project will partner with the School of Aeronautics and JetBlue Foundation to support student pilots from economically disadvantaged backgrounds. This program will aid in certifications and provide support toward pilot licenses. The Puerto Rico Aviation Maintenance Institute (PRAMI) is the only institution in Puerto Rico that complies with Federal Aviation Administration (FAA), part 147 for Aviation Maintenance Technician schools. Following Hurricane María, their library and equipment were damaged or destroyed. The Interactive Learning Space will receive special new equipment and will use special technical software to supplement traditional classroom learning. The initiative will also help PRAMI comply with the Puerto Rico Approval State Agency for accreditation and the FAA requirements. The JetBlue Foundation’s new president, Ursula Hurley, was on hand to distribute these grants at a special ceremony where she met with the organizations that provide access to students and communities traditionally under-represented in STEM fields. The JetBlue Foundation was founded in 2013 with a mission to reach 5,000 students in five years and provide educational opportunities through grants and in-kind support to diverse programs, volunteerism and partnerships. Former JetBlue Foundation President Joanna Geraghty, who is currently president and chief operating officer at JetBlue, met this mission and recently passed the baton to Hurley. Hurley, who also serves as vice president and treasurer at JetBlue, will guide the Foundation in its next chapter of empowering future aviation professionals. About JetBlue in Puerto Rico – JetBlue launched service to San Juan in 2002, and later expanded service into Ponce and Aguadilla. Today, JetBlue is Puerto Rico’s largest airline and the island is home to nearly 500 JetBlue crewmembers who support the airline’s operations in its focus city of San Juan, as well as in Aguadilla and Ponce. JetBlue’s mission of inspiring humanity, and its crewmembers in Puerto Rico have enthusiastically supported the local community over the past 16 years, including through the 100x35JetBlue hurricane relief and recovery initiative. A nod to the island’s 100x35 mile dimensions, 100x35JetBlue outlined 100 days and 35 ways – and beyond – of caring for Puerto Rico and the Caribbean.